This is a battle that never ends between the two biggest rivals in the smartphone market where the latest device from Apple is their iPhone 5, and Samsung just came up with the Samsung Galaxy S4 smartphone. These both differ a lot, but are never out of comparison as it is a battle of beasts when the flagships are compared. The main issue in the comparison that would take the interest away is the Interface and operating system, which are totally different in both the devices, and would be one of the major factors for many to select one of them. While we like the way Apple keeps it simple with the standard iOS interface, the Samsung Galaxy series phones have always come with the easy-to-use TouchWiz UI which can be modified to any extent, enhancing the user experience. 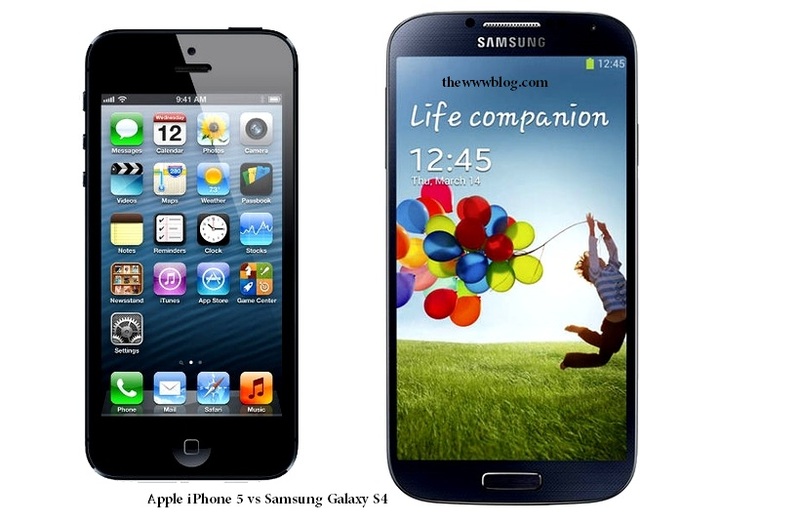 The biggest differences start from the screen size itself, where the Galaxy S4 from Samsung is an inch bigger than the iPhone 5, which is the biggest of all the iPhone versions that have been launched by Apple. Although we talk about the sizes being very different, the display of the S4 is a lot better although Apple brands the iPhone with the Retina Display, as the former has got a 1080p Full HD display, with the pixel density of 441 PPI, while the 640p display in the iPhone 5 has a pixel density of 326 PPI. And as of now, we are talking only by checking the specs, but we are sure to be blown off when we have the device and do a hands-on. How much ever both the brands talked about the processor and the speed of the interface in the launches last year, there was lagging on heavy usage but if you go with what Samsung has included in their latest best smartphone, the same cannot be seen anywhere as of now. There”s an Octa core processor in the S4, i.e. 8 cores! The availability would depend on the region though, but still talking about the actual details, the Galaxy S4 surely seems to have an edge over the iPhone 5 with the excellent processor, which is again backed by the 2GB of RAM. No wonder why the Cameraphones list in Flickr had all the iPhone versions on the top, just followed by the Samsung Galaxy S III. But with the S4 having a real better 13-megapixel shooter on the rear side, online casino the equation should change soon. Samsung has been smart enough to include loads of features that could help making the camera captures better, live and stand out ahead of the other smartphone cameras. Specs wise, it is the 13MP camera in the Galaxy S4, while an 8MP camera in the iPhone 5. The front cam in the S4 is of 2MP quality, able to capture 1080p videos while the front cam in the iPhone 5 is of 1.2MP quality capturing 720p videos. Operating System – Need to compare? We won”t talk about the operating systems at all, as it is the only main factor that a user has to check for himself and decide which they feel easier and better to use, because the iOS 6 and the Android 4.2.2 Jelly Bean with TouchWiz UI are entirely different. The latest iOS version is iOS 6.1.2 with quite a few improvements too, but comparing the physical aspects would bring out a good result. A few other factors where the comparison can be extended to, include the NFC connectivity which the Apple devices have never got, whereas the Samsung Galaxy S4 can do a lot of stuff, even location-based using the NFC feature. Let”s talk about the similarity here – Health based accessories! There are several accessories that are available at the Apple Store for the iPhone 5, which all help in maintaining fitness and tracking the health vitals, and Samsung hasn”t kept itself behind in this aspect, as the Galaxy S4 health accessories include the S Band, Heart Rate Monitor and Body Scale. May that be Apple or Samsung, a user would have the pricing factor in mind before making a final decision. And we would end it with a teaser, Apple is soon going to come up with the newer version of the iPhone, a moment of joy for the Apple iPhone fans who would get to see a better comparison then!